Scunthorpe grabbed their first away win of the Championship season by convincingly beating Crystal Palace. A Danny Butterfield mistake allowed Jonathan Forte to round keeper Julian Speroni and slot the visitors ahead. Rob Jones's flick allowed Paul Hayes to nip in at the near post and score before Sam Togwell drilled in a shot to put Scunthorpe 3-0 up. Michael O'Connor's cool finish compounded Palace's misery along with a Freddie Sears penalty being saved. "I hope the lads go home tonight as embarrassed as me. We can't play like that. I can't think of a bigger embarrassment in my career. "All you can do is apologise to the fans who I thought were terrific. I would crucify the manager if I was one of them after that." "I don't think Scunthorpe have scored a good goal. I'm not knocking them, we absolutely put it on a plate for them. They must think they won the pools." "I was delighted to keep a clean sheet. It's the first time since pre-season that we have been able to work defensively as a back four. I've not had the defence that I wanted. "It was great character from the players. We are newly promoted and have had some difficult results away from home. We lost 4-0 twice and had not managed to score. "We changed our formation to be a bit more defensive and to give ourselves a chance going forward. With the players we have, we can score goals." 90:00+2:58 The referee blows his whistle to end the game. 90:00+0:39 Alassane N'Diaye has an effort at goal from deep inside the area missing to the right of the goal. 88:21 Headed effort from inside the penalty area by Alassane N'Diaye misses to the right of the target. 87:07 Sean Scannell fouled by Garry Thompson, the ref awards a free kick. Free kick taken by Danny Butterfield. 85:25 Substitution Gary Hooper joins the action as a substitute, replacing Jonathan Forte. 84:31 Garry Thompson fouled by Jose Fonte, the ref awards a free kick. Marcus Williams takes the free kick. 83:57 Jose Fonte challenges Josh Wright unfairly and gives away a free kick. Joe Murphy takes the free kick. 83:16 The offside flag is raised against Paul Hayes. Julian Speroni restarts play with the free kick. 81:55 Substitution Matthew Sparrow replaces Michael O'Connor. 79:08 Penalty taken by Freddie Sears saved by Joe Murphy. Crystal Palace 0-4 Scunthorpe. 79:08 Sam Togwell is penalised for handball and concedes a . 78:11 Sean Scannell takes a shot. Blocked by Marcus Williams. Outswinging corner taken right-footed by Danny Butterfield from the right by-line, save made by Joe Murphy. 76:52 The assistant referee flags for offside against Freddie Sears. Joe Murphy takes the free kick. 75:58 The ball is sent over by Jonathan Forte, Garry Thompson produces a mishit right-footed shot from deep inside the penalty box which goes wide of the left-hand upright. 75:04 Substitution Garry Thompson comes on in place of Martyn Woolford. 73:11 Unfair challenge on Freddie Sears by Martyn Woolford results in a free kick. Direct free kick taken by Neil Danns, The ball is crossed by Michael O'Connor, Rob Jones manages to make a clearance. 71:02 Free kick awarded for a foul by Paul Hayes on Jose Fonte. Danny Butterfield takes the free kick. 70:32 Shot from 35 yards by Jose Fonte went wide of the right-hand post. 67:08 Assist on the goal came from Jonathan Forte. 67:08 GOAL - Michael O'Connor:Crystal Palace 0 - 4 Scunthorpe Michael O'Connor finds the back of the net with a goal from inside the box to the bottom right corner of the goal. Crystal Palace 0-4 Scunthorpe. 65:29 Assist on the goal came from Jonathan Forte. 65:29 GOAL - Sam Togwell:Crystal Palace 0 - 3 Scunthorpe Sam Togwell gets on the score sheet with a goal from inside the box low into the middle of the goal. Crystal Palace 0-3 Scunthorpe. 63:19 Substitution Ryan Smith replaces Victor Moses. 63:19 Substitution Freddie Sears joins the action as a substitute, replacing Darren Ambrose. 61:53 The official flags Jonathan Forte offside. Indirect free kick taken by Julian Speroni. 57:17 The assist for the goal came from Rob Jones. 57:17 GOAL - Paul Hayes:Crystal Palace 0 - 2 Scunthorpe A goal is scored by Paul Hayes from deep inside the penalty box to the bottom right corner of the goal. Crystal Palace 0-2 Scunthorpe. 56:44 Unfair challenge on Marcus Williams by Darren Ambrose results in a free kick. Josh Wright restarts play with the free kick. 52:12 Unfair challenge on Jonathan Forte by Alassane N'Diaye results in a free kick. Joe Murphy restarts play with the free kick. 51:25 David Mirfin challenges Victor Moses unfairly and gives away a free kick. The free kick is delivered right-footed by Darren Ambrose from right channel, David Mirfin makes a clearance. 49:57 Corner from the right by-line taken by Darren Ambrose, free kick awarded for an unfair challenge on Rob Jones by Jose Fonte. Free kick taken by Joe Murphy. 48:49 Unfair challenge on Sean Scannell by Rob Jones results in a free kick. Free kick crossed right-footed by Darren Ambrose from right wing, clearance made by Jordan Spence. 45:01 Substitution Alan Lee leaves the field to be replaced by Sean Scannell. 45:00+0:59 It is the end of the first-half. 44:28 Jose Fonte fouled by Jonathan Forte, the ref awards a free kick. Danny Butterfield takes the direct free kick. 42:55 Victor Moses takes the chance to get an effort at goal. Save by Joe Murphy. 41:25 Neil Danns takes a shot. Save by Joe Murphy. 41:00 Inswinging corner taken right-footed by Darren Ambrose, clearance by David Mirfin. 40:26 Corner taken right-footed by Darren Ambrose from the left by-line to the near post, clearance made by Rob Jones. 39:14 Darren Ambrose takes a shot. Save by Joe Murphy. 38:42 Effort on goal by Shaun Derry from 20 yards. Joe Murphy makes a save. Corner taken right-footed by Darren Ambrose from the left by-line, Rob Jones makes a clearance. 37:36 Jose Fonte concedes a free kick for a foul on Jonathan Forte. The free kick is delivered right-footed by David Mirfin from right channel, clearance made by Jose Fonte. 36:09 Foul by Alassane N'Diaye on David Mirfin, free kick awarded. Joe Murphy takes the direct free kick. 35:34 Darren Ambrose produces a cross, save made by Joe Murphy. 34:37 Michael O'Connor challenges Darren Ambrose unfairly and gives away a free kick. Direct free kick taken by Julian Speroni. 34:02 Jonathan Forte takes the inswinging corner, clearance made by Alassane N'Diaye. 31:12 The ball is crossed by Martyn Woolford, Julian Speroni makes a comfortable save. 28:55 Shot from inside the area by Alassane N'Diaye clears the bar. 28:29 Shot by Sam Togwell. Jose Fonte gets a block in. 26:50 Danny Butterfield has shot on goal from just outside the box which goes wide of the right-hand upright. 26:14 Free kick awarded for an unfair challenge on Clint Hill by Paul Hayes. Direct free kick taken by Julian Speroni. 23:10 Foul by Jonathan Forte on Jose Fonte, free kick awarded. Danny Butterfield crosses the ball, Header on goal by Clint Hill from inside the box goes harmlessly over the target. 20:17 Corner taken by Darren Ambrose from the right by-line, Rob Jones makes a clearance. 18:53 The ball is sent over by Victor Moses, Joe Murphy makes a save. 17:30 Jose Fonte concedes a free kick for a foul on Jonathan Forte. Free kick crossed right-footed by Josh Wright, Julian Speroni makes a comfortable save. 15:26 Free kick awarded for an unfair challenge on Victor Moses by Jordan Spence. Clint Hill delivers the ball from the free kick left-footed from left wing, clearance made by Rob Jones. 13:30 Clint Hill challenges Paul Hayes unfairly and gives away a free kick. The free kick is delivered right-footed by Michael O'Connor from right channel, clearance by Clint Hill. 12:55 Unfair challenge on Jordan Spence by Victor Moses results in a free kick. Jordan Spence takes the direct free kick. 11:24 Unfair challenge on Jordan Spence by Alan Lee results in a free kick. Joe Murphy takes the free kick. 6:51 Corner from left by-line taken by Darren Ambrose. 3:58 GOAL - Jonathan Forte:Crystal Palace 0 - 1 Scunthorpe Jonathan Forte scores a goal from inside the area low into the middle of the goal. 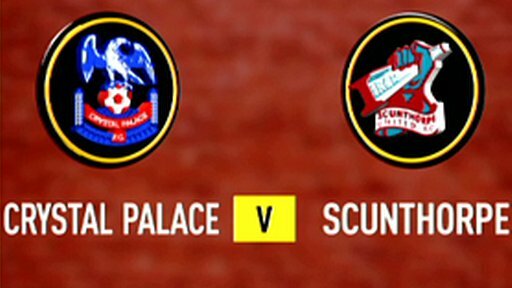 Crystal Palace 0-1 Scunthorpe. 2:50 Jonathan Forte concedes a free kick for a foul on Matthew Lawrence. The free kick is delivered left-footed by Clint Hill from own half, clearance by David Mirfin.